Sorry for the short post this week; I need to allow the graphic to speak for itself. If you have a bike and can ride it safely (and have a means to carry food on it or on your person) please meet at Fairway Market in Stamford tomorrow (699 Canal Street) with your food donations at noon and we’ll pedal them up to the Food Bank of Lower Fairfield County - which is at 461 Glenbrook Road. This is the second time this event is taking place and the first time I get to take part in it. If you remember: even though I came up with Food Bank Biking in 2013 I couldn't do it since I was in Cleveland (but I still made a food bank run there!) But this year I can take part and I'm excited about it. This will be fun and one of the last days this year we’ll be able to ride without dressing like Snake Eyes from the G.I. Joe cartoons. Also, if you’ve read the recent Stamford Advocate story by Martin Cassidy: the food bank is desperately short of donations - especially turkeys - this year, so please take part in this. 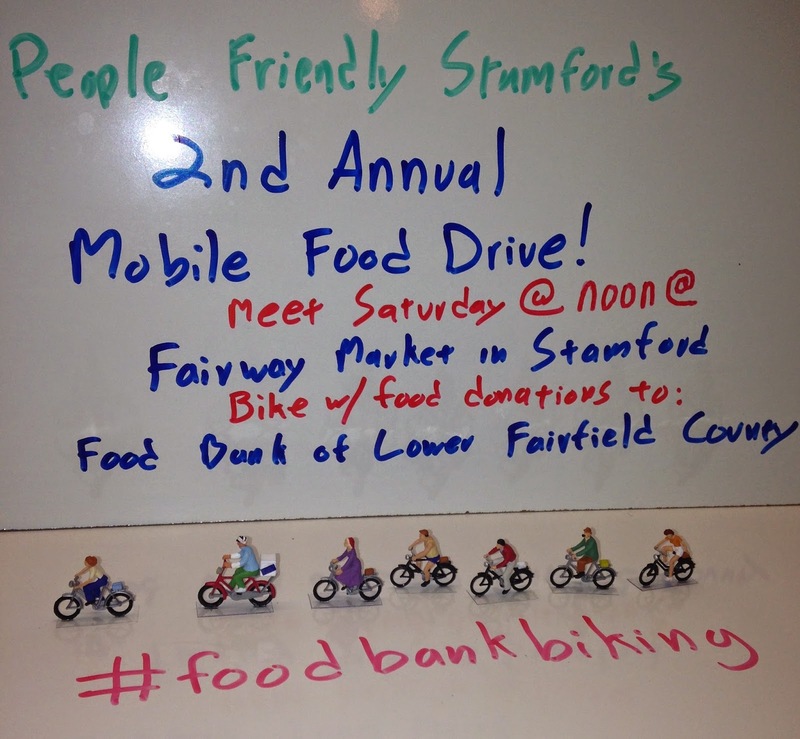 Finally, if you don't live in Stamford and want to organize a Food Bank Biking event of your own: just meet friends the last Saturday before Thanksgiving at a grocery store before riding to the food bank - and use the hashtag #foodbankbiking. Thanks for reading and thanks for riding.